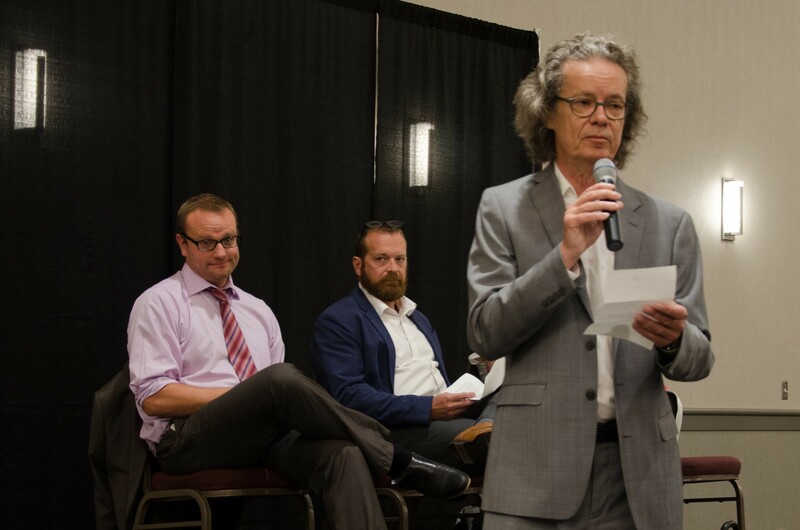 TRU’s inaugural town hall was regarded as “a good open discussion” and “very good first step” by the presidents of TRU and its faculty association. The town hall, which was attended by approximately 100 people on Sept. 15, saw the audience, mainly TRU faculty, ask questions and raise issues from course approvals and transparent governance to the new logo for the university. Answering questions were four senior TRU administrators: President Alan Shaver, VP Academic Christine Bovis-Cnossen, VP Administration & Finance Matt Milovick, and VP Advancement Chris Seguin. TRUFA President Tom Friedman attended the town hall but did not take the mic, saying later in an interview that he decided that it was a good chance for individual faculty members to raise issues. “I wanted them to be the ones to speak out,” Friedman said, adding that he felt that the town hall was a good step towards transparency and understanding the level of discontent felt by faculty. At this point, Friedman believes that what faculty are now looking for is follow-through on the issues raised at the town hall. Shaver formed a checklist at the town hall and is hoping to address as many issues as possible in the next 12 months. “I committed to going down the checklist and trying to address as many as possible in the next 12 months so that we can be accountable 12 months from now at the town hall meeting in the fall of 2017,” he said. Shaver also noted that a report on the town hall is being prepared and will be presented to the three governing bodies of TRU. Going into the town hall, Shaver said he was completely open and tried not to have any preconceived notions on what would be brought up. He also felt that the dialogue was mostly positive. “I thought that they were asking for changes in a very reasonable way and that they were asking for very reasonable changes,” Shaver said. When it comes to future cooperation between administration and faculty, Friedman hopes that administration can see the faculty association as partners rather than adversaries. “Sometimes we won’t agree with administration, but at least if there is a full discussion then there is the possibility of working together. That collegial approach is what we at the faculty association have been pushing for,” Friedman said. While the next general town hall won’t be held until next fall, a second town hall will be held later this school year on the budget.